Today I want to show you what I created last night. This style was so much easier to create than I had imagined and I love it. 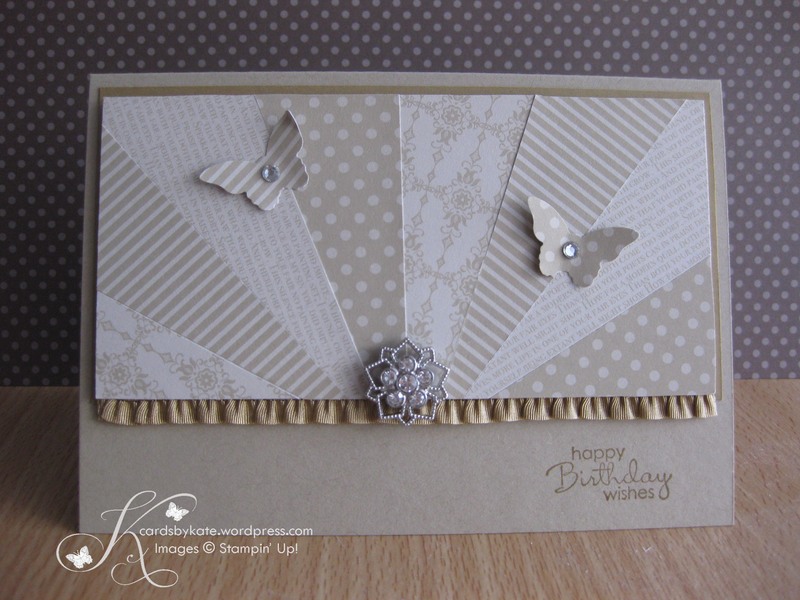 I will be making many more of these with Stampin’ Up!s other Designer Series Papers for sure. And that reminds me, the DSPs are on sale at the moment from 1-28 August ~ Buy 3 get 1 FREE! It is amazing value. CLICK HERE to go to my online store to choose your designer series papers. I have used papers from the Neutrals DSP Stack (Order here). You may notice that a NEW item has appeared that you may not have seen before and it is the little embellishment in the centre! Isn’t it just gorgeous? These will be available to purchase in the new Holiday Catalogue from 29 August 2013. Be sure to visit my Blog on that day to view the online version of the Holiday Catalogue jam-packed with loads of festive products or drop by to collect your copy now!